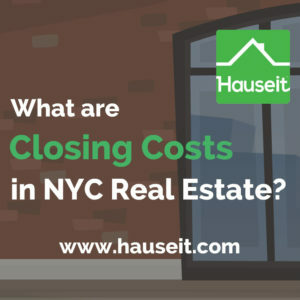 What Are Closing Costs in NYC? Closing costs in NYC range from 1.5% to 6% for buyers and 8% to 10% for sellers. Buyer closing costs are higher if you purchase new construction or finance your purchase with a mortgage, and are lower if you purchase a re-sale or a co-op apartment. Seller closing costs are higher if you are selling a co-op primarily because of the flip tax that many coop buildings charge. The largest closing costs in NYC for buyers include the Mansion Tax, the Mortgage Recording Tax and title insurance. The NYC Mansion Tax is a one-time tax of 1% to 3.9% for all sales of $1 million or more customarily paid by buyers. The Mortgage Recording Tax can be almost 2% of the loan amount but only applies for condos, houses and other real property but not for co-ops. Title insurance also only applies towards real property purchases such as condos and houses, but not co-ops. Title insurance is approximately 0.4% to 0.45% of the purchase price and is only paid once at closing. The biggest seller closing costs in NYC are the typical real estate commission of 6% of the sale price, the NYC and NY State transfer taxes and the flip taxes charged by co-op buildings. Fortunately for sellers, it’s possible to eliminate broker fees entirely through an Agent Assisted FSBO, or dramatically reduce broker fees through a 1% for Full Service listing. Transfer taxes are harder to avoid however, and can be almost 2% of the sale price for your average NYC apartment. Flip taxes are only levied by some co-op buildings and will vary by building. Some co-ops might not charge any flip tax, but you’ll often see buildings charge a flip tax of anywhere from 1% to 2% of the sale price. Need more concrete figures? Figure out what your buyer closing costs are with our interactive Buyer Closing Cost Calculator for NYC. Selling? Estimate your seller closing costs with our handy Seller Closing Cost Estimator for NYC. What are Closing Costs in NYC for Sellers? Seller closing costs in NYC are between 8% to 10% of the sale price, assuming you’ve paid a typical real estate commission of 6% of the sale price. Your seller closing costs will vary depending on whether you are selling a condo or a co-op apartment, primarily because many co-op buildings will charge a flip tax of 1% to 2% of the sale price. A typical NYC seller of a $1.87 million apartment can expect to pay between $153,178 (condo) and $181,728 (co-op) in closing costs! That is some serious money. Fortunately, the largest seller closing cost (broker commissions) is the one which you can most easily reduce or eliminate. Sellers can save up to 6% in commission by listing Agent Assisted FSBO or by working with a full-service agent for just 1%. The highest closing costs for sellers in NYC is the typical 6% real estate commission. Despite advances in technology, broker commissions in NYC have remained stubbornly fixed around 6%. To make matters worse, it’s still very difficult for a seller to negotiate commissions with a prospective listing agent. In the era before the internet and smartphones, the 6% real estate commission was somewhat justifiable. Listing agents in the 80’s, 90’s and early 2000’s did not have the ability to click a button and syndicate your listing to dozens of real estate websites all at once. Back then, agents had to spend large amounts of money and time on newspaper advertising and other word of mouth marketing methods. Fast forward to today and listing agents can easily syndicate your listing on the internet to broker databases and property search websites like the REBNY RLS, New York Times and StreetEasy in a matter of minutes. Despite all these advances in technology, listing agents in NYC still stubbornly refuse to go below 6% in commission to sell your home. New Yorkers have options. You can save all 6% in NYC broker commission by listing Agent Assisted For Sale by Owner in NYC. Seller closing costs in NYC are high enough, so why add another 6% to your bill by hiring a full commission listing agent? Join hundreds of fellow New Yorkers who have sold on their own with the help of Hauseit’s Flat Fee RLS Listing Service. Not convinced? Google “Hauseit Reviews” to see what customers are saying about us. Listing your home on RLS (REBNY Listing Service) is the only effective way to market your property to the 75% of buyers who are represented by buyer’s agents. RLS is a broker-only database in NYC which displays the available listing inventory and buyer agent commission information in New York City. Because every listing in RLS has a contractually listed and guaranteed commission, buyer agents typically only show RLS listings to their buyers. Furthermore, most buyer agents in NYC search for listings using software which feeds directly from RLS. By not listing in RLS, your listing will either be missed or ignored by the vast majority of the city’s 20,000 buyer agents. Failure to list on RLS is one of the most common reasons why traditional NYC FSBO sellers fail. Traditionally, the only way to list your home on RLS was to pay 6% in commission to a full-service, REBNY member listing agent who had access to RLS. As a seller in NYC, you can list on RLS and save up to six percent in commission through Hauseit’s Flat Fee RLS Listing Service. Listing in RLS offers your home full exposure to over 20,000 REBNY member buyer agents in NYC. What if your buyer is unrepresented? Listing through Hauseit’s Flat Fee RLS Listing Service means that you won’t pay any percentage commission if your buyer is unrepresented. You’d only owe a buyer agent commission if you knowingly accept an offer from a buyer with a buyer’s broker. One of the most common shortcuts FSBO sellers take in NYC is skimping on professional photography. Making a condo or co-op marketable and attractive to buyers isn’t rocket science. When you put your home on the market, it’s going to be competing with traditional listings which almost always have stunning professional photographs. Competing against full-service listings with professional photography means that your listing’s photos must be on an equal playing field. Given the small cost of professional photography, going the route of professional photography is a no-brainer. Maximizing your chances of saving six percent in commission also necessitates the investment in excellent photos and a professional floor plan. Can I just change my photos after I’ve listed? Listing traffic and momentum is the highest in the first few weeks after you list, so it’s important that you have professional photos from day one. Waiting a few weeks and then replacing your photos is a poor strategy because you will have missed the opportunity to showcase professional photos to the largest pool of potential buyers and buyer brokers earlier on in the sale process. Being a smart and successful FSBO seller is all about being realistic and honest with yourself about your listing’s pricing from day one. Going to market with the wrong listing price could literally determine your success or failure before you’ve even started showing your property. Sellers who overprice and then make prolonged and inadequate reductions over the course of many months almost always lose confidence and fail to sell. FSBO sellers who fail to sell due to unrealistic pricing typically end up hiring a 6% listing agent who persuades them to re-list with rock bottom pricing. This makes for an easy payday for the lucky listing agent who benefits at the expense of the seller whose original pricing was unrealistic. What if I need to make a certain profit on my sale? Having an arbitrary profit target in mind which requires an above market sale price is unrealistic and dangerous. As a base case, you should never assume that someone will pay above market value for your property. Reducing your price later on won’t allow you to take advantage of the early traffic boost and momentum that you receive in the first few weeks after listing. Before listing, we encourage you to prepare a comparative market analysis. You may view example CMAs in Hauseit’s forum. If you are interested in a professional opinion on your pricing, you may consider professional broker consulting or listing through Hauseit’s 1% Full-Service Listing Option. Your only realistic chance of succeeding as a FSBO seller in NYC is if you’ve done your homework on how the sale process works. Doing your homework before listing is an essential component in setting expectations, building your confidence as a seller and knowing how to navigate the sale process. Before listing, we encourage you to thoroughly review the resources below. If you are selling a condo and co-op, we suggest you contact your managing agent and request all the building’s sale documentation such as the Purchase Application, Offering Plan and two most recent years of financials. You should also hire an attorney and educate yourself on each step of the sale process. Save thousands by listing with a full service, highly rated REBNY Member Firm in NYC for just 1% commission. You shouldn’t have to pay 6% simply because you don’t have the time or energy to sell FSBO in NYC. New York City levies a tax on the sales, grants, assignments, transfers or surrenders of real property in NYC. The NYC Real Property Transfer Tax (RPTT) is a tax of 1%-1.425% on residential real estate transactions. The NYC Transfer Tax is typically paid by the seller along with a RPTT filing fee of $100. Estimate your seller Transfer Tax Bill using Hauseit’s Interactive Transfer Tax Calculator. New York State also charges home sellers a transfer tax of 0.4% of the sale price. The full NY State Transfer Tax is due and payable along with form TP-584 no later than the 15th day after the delivery of documents. As part of the April 2019 changes to the New York Tax Law, a higher tax bracket of 0.65% was enacted for all residential sales of $3 million or more. It’s highly recommended that NYC sellers obtain top notch legal representation when completing the home sale process. Given the various legal risks and documentation requirements required of the seller, it’s a no brainer to hire an attorney so that you may sleep easy at night. You may be able to find a lawyer who charges less than one thousand dollars, however we advise you to proceed with caution. Having questionable, low-quality representation could cost you thousands of dollars down the road. We are in touch with fairly priced and proven, highly-experienced real estate attorneys if you need an introduction. Furthermore, many of our attorney partners have agreed to friends and family discounts and additional help (i.e. board package preparation) for Hauseit customers. It’s important to have an attorney lined up ideally before you submit an offer. This way your buyer agent can credibly say that you are ready to move fast with an attorney on standby who can review the purchase contract ASAP. Contact us today for an introduction to a local expert! The specific amount of move out related deposits and fees varies by building. A general rule of thumb is to budget around $1,000 for a refundable move-out deposit and another $1,000 in potential non-refundable move out and closing related fees levied by your condo or co-op. Co-op flip taxes are legally permitted provided that the flip tax details are present in the co-op’s proprietary lease or if the flip tax has been added as an amendment to the lease through the approval of more than 67% (2/3rds) of shareholders of the co-op. Does it seem fair that sellers of co-ops must give away a portion of their profits to the co-op? We don’t think so. However there is a historical reason why most if not all co-ops in NYC levy a fee to their departing residences. During the rental conversion boom in the 1970s and 1980s, sponsors were faced with the challenge of poorly maintained buildings as well as long term rent controlled residents who could not afford to purchase a unit in the building. As a result, the conversion sponsor offered many of their rent controlled tenants the ability to purchase units in the building at substantially below-market prices. As the converted rental tenants often made substantial profits during a sale, the co-ops decided to levy a flip tax on the beneficiaries of these profitable sales in order to fund the much needed improvements to the building for the long-term, committed residents. The original conception of the flip tax was as a temporary tax on quick flip sellers to fund renovations, however co-ops soon began making them permanent once they realized the size of the recurring revenues they could generate for the building. Most of the time, the flip tax is paid by sellers. However, depending on building rules and the current state of the market (buyers’ or sellers’ market), the buyer may opt to pay the flip tax instead of the seller. 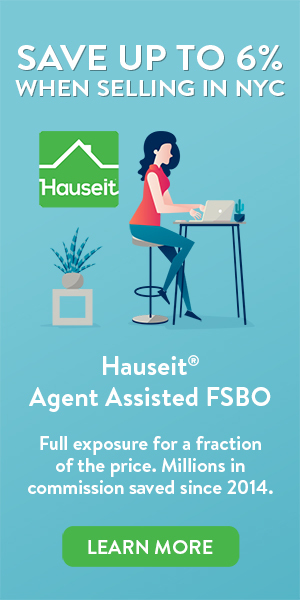 You can save money when buying and selling with Hauseit, NYC’s largest FSBO (For Sale by Owner) and Buyer Closing Credit Company. Sellers can save up to 6% in commissions by listing Agent Assisted FSBO or by working with a full-service agent for just 1%. Buyers can save $20,000 or more and reduce their closing costs by requesting a Hauseit Buyer Closing Credit. What are Closing Costs in NYC for Buyers? Buyer closing costs in NYC are substantial and range from 1.5% – 6% of the purchase price. Buyers of co-op apartments under $1 million will face the lowest closing costs, while buyers of new construction condos over $1 million who finance their purchase will face the highest closing costs. Keep in mind that some closing costs are negotiable, especially when buying a new construction home in NYC in a softer market. As a buyer, you can save $20,000 or more and reduce your closing costs by requesting a Hauseit Buyer Closing Credit. Requesting a Hauseit Buyer Closing Credit is a legal and non-taxable way to discreetly save money on your purchase and reduce your buyer closing costs in NYC. Closing costs are higher for condos than co-ops, and closing costs are always greater for ‘new construction’ (sponsor) sales. In most cases, you will also pay higher closing costs if you are financing the purchase vs. making an all-cash transaction. Should I buy a co-op or a condo? Is buying a coop a good investment in NYC? Read our article on the pro’s and con’s of buying a co-operative apartment in New York City before you begin your home search! The New York City Mansion Tax applies to the sale of residential property valued at or above $1 million. The Mansion Tax consists of 8 individual tax brackets which range from 1% to 3.9% of the purchase price. The lowest tax rate of 1% applies to purchases of $1 million or more and below $2 million, and the highest rate of 3.9% applies to sales of $25 million or more. Estimate your Mansion Tax bill using Hauseit’s Interactive Mansion Tax Calculator for Buyers. Prior to 2019, the Mansion Tax was a fixed 1% of the purchase price for sales of $1 million or more. The tax was originally implemented in 1989 to help combat a budget deficit. The Mansion Tax rates were increased as part of changes to the New York Tax Law in 2019. You may be able to reduce or fully eliminate the Mansion Tax on your purchase by requesting a Hauseit Buyer Closing Credit. The typical NYC buyer closing credit can save you $20,000 or more on your purchase, covering some if not all of your buyer closing costs. Title insurance offers the buyer protection against any future claims made against the title for issues which were undiscovered at the time of the purchase when the original title search was conducted by the insurance agency. In the event that you are financing your purchase, title insurance would consist of two parts: a lender’s policy, which covers the amount of the loan exposure and declines over time as you make payments, and an owner’s policy, which is taken out for the full purchase price and does not decline over time. The costs of title insurance in New York State can be substantial. There are many factors which contribute to this, although the primary reason is overall lack of competition in the industry. As of 2015, New York State is currently looking into ways to increase competition and reduce the price for consumers. Since co ops do not have physical titles, buyers of these units can avoid title insurance completely. For NYC co op buyers, the combination of not having to pay for title insurance or the NYC/NYS Mortgage Tax (in the event a bank loan is needed) means that co op buyer closing costs in NYC are substantially lower than for condos. As is the case for sellers, It’s highly recommended that NYC home buyers obtain top notch legal representation when completing the home purchase process process. Given the various legal risks associated with such a large purchase, it’s a no brainer to hire an attorney so that you may sleep easy at night. You may be able to find a lawyer who charges less than $2,500, however we advise you to proceed with caution. Having questionable, low-quality representation could cost you thousands of dollars down the road. We are in touch with proven, highly-experienced real estate attorneys if you need an introduction. Depending on the rules of the condo or co-op in which your unit is located, you may be required to make a refundable ‘move-in’ deposit. You can generally expect to recover this money in the future, however as it is a required cash outlay it’s worth budgeting for in your purchase calculations. Please note that these figures include the NYS mortgage tax of 0.5% in addition to additional NYC-specific mortgage tax elements. Fortunately, buyers of NYC co-ops are exempt from the Mortgage Recording Tax because co-op owners hold shares in a building instead of owning real property with a deed. Learn more about NYC real estate taxes and the associated costs of home ownership in New York City!